“Life in all its fullness is nature’s laws obeyed.” Dr. Weston A. Price. I have seen these words many times, but I did not really understand them. Until now. I have been very ill for most of my life. I have had a lot of medical treatment. Most treatments would relieve the symptoms, for a while, than the symptoms would return, worse than ever. Yet when I followed the Weston A. Price diet, did what I could to avoid toxins, switched to grassfed meat, and had no medical care, all my symptoms went away, and they did not return. And my body functions began to improve, and they are still improving. At 58. Many body functions that did not work, such as having a sense of smell, being able to breathe through my nose, breathe effortlessly, and sleeping through the night, returned. Other body functions that had been deteriorating such as hearing, eyesight, digestion, sense of touch, taste, and flexibility, are now improving. My mental attitude also improved enormously. I began waking up with a sense of joy and eagerness to live the day, a feeling I last had when I was a child. My usual mental feeling could best be described as a happy, peaceful contentment. Modern medicine is focused on treating a particular disease, defined by a set of symptoms. These days, the disease is treated with artificial medication, or surgery, or radiation, or all three. All of these treatments are a massive and powerful assault on the body and its natural systems, often doing great harm. Success is defined by a cessation of the symptoms. Usually, the symptoms return in the future, worse than before, and the cycle begins again. We all have an immune system, and other bodily functions that are designed to fight off disease and keep us healthy and regenerating. Modern science and medicine arrogantly claim to know how they work, but this knowledge is still incomplete. They just know the tip of the iceberg. This iceberg is powerful and complex beyond our understanding. We have a powerful desire to eat, and eat food that will satisfy us. We are born with it. The healthy peoples studied by Dr. Weston A. Price did not have the chronic diseases that plague modern humanity. They did not have scientists, or laboratories. They did not have doctors or dentists, though they had healers. They knew far less about the tip of the iceberg than we do. But they knew something very important. They knew how to feed the body, the whole body. And the body sustained and protected them, just as nature intended. These peoples did not have peer-reviewed studies, or computers, but they had something else. The accumulated experience of thousands of years of living, passed down from mother to daughter, from father to son, from healer to healer, from wise person to wise person. This priceless knowledge was based on the combined experience of tens of thousands, even millions of the ancestors of their people, who paid careful attention to their own observations, filtered through the wisdom of common sense, and passed on this knowledge. The healthy peoples studied by Dr. Price knew what to eat, and what not to eat. They knew how to prepare food. They knew how to combine food. They knew how to preserve food, though they had no refrigerators. They knew how to satisfy their hunger, with the right foods, properly prepared. They did not decide what the laws of nature were, they discovered them. They knew how to avoid the natural toxins and dangers in their land. They obeyed the laws of nature, and were rewarded. I think modern people have lost most of this knowledge, and no longer know how to obey nature’s laws. We have tried to substitute the incomplete knowledge of science and technology for the laws of nature, to make our own laws. And we have suffered terribly for this, as shown by the huge and increasing amount of chronic illness in the most “advanced” nations. Science and technology have accomplished wonderful things in many areas, and have greatly improved life. But their knowledge in the area of nutrition and health is partial and incomplete. I support real research, research based on the desire to learn and share, rather than the desire to exploit. But much of this research has not been completed. I think my body’s functions were supported and activated. I think that the changes I made enabled my body’s systems to function the way nature intended them to. I think the avoidance of toxins reduced the burden on my body’s systems, enabling them to function better. I think that following the Weston A. Price diet, eating traditional foods, and eating traditional food combinations gave my body’s systems the fuel and resources they needed to function properly. I don’t know how to cure, prevent, or mitigate any disease. But following the old wisdom discovered by Dr. Price has allowed me to follow nature’s laws, which has enabled my body to function properly. And I enjoy the fullness of life. For more information about Dr. Weston A. Price, please visit these websites: The Weston A. Price Foundation and Price-Pottenger Nutrition Foundation. This post is also part of Fight Back Friday Blog Carnival at Food Renegade. Real Food Media blogger Ann Marie Michaels, also known as Cheeseslave, has done a podcast interview with me. Ann Marie is an expert on real food, and it was an honor to be interviewed by her. We covered a number of issues concerning grassfed meat: why it must be cooked differently from factory meat; how I learned how to cook grassfed meat; some barbecue tips for July the Fourth; why grassfed meat is sustainable and better for the planet; how it differs from conventional meat; how grassfed meat is so nutrient-dense and satisfying; the benefits I received from eating grassfed meat; how traditional food combinations provide complete and superior nutrition; even what to add to US Wellness liverwurst to make it into a spreadable pate; and more! I found Ann Marie’s questions and comments to be insightful and invaluable, and I really learned a lot during this interview, which I greatly enjoyed. Ann Marie has been spreading the word about real food for some time now, and I highly recommend her blog. Once it was traditional for even a middle class family to have a large roast on Sunday. This was the main meal of the week, and was eagerly anticipated. This tradition was very popular in England, Ireland, and the United States. The attraction of a large roast of tender, juicy, delicious meat is obvious. But what is not so obvious is that the leftover meat could provide several additional great meals. Using the leftovers from the Sunday roast for other meals became so much of a tradition in England that there was even some verse on the subject – “Roast on Sunday, Cold on Monday, Chopped on Tuesday, Pie (Shepherd’s) on Wednesday.” The tradition of having several meals from one roast has been reinstituted in my family, but we have found tastier choices than cold, chopped, or pie. It really is a money saver to have one roast provide four meals, and we do it whenever we have a large roast. The additional meals we cook surely do not taste like “leftovers”—they are just delicious. Meat was far too expensive to waste in old Europe, so the Europeans developed a number of ways of reheating cooked meat into a delicious new meal. In fact, many old cookbooks suggest that a pot roast is at its best reheated, not fresh. These books actually advocate cooking a pot roast on one day, letting it sit overnight, then slicing it and reheating the slices in the gravy. Cooked meat can develop even more depth of flavor and become more tender when it rests in the refrigerator. One of the most famous examples of this tradition is Bigos, which is considered by many to be the Polish national dish. Bigos is a combination of pork, sausage, mushrooms, sauerkraut, fresh cabbage, and many other ingredients. It was reheated each day, and was said to reach its peak flavor on the seventh day. The point is that leftovers can be turned into delicious meals. The favorite cut for the Sunday roast was, without question, prime rib of beef. This is a truly magnificent roast. Crowned with a superb cap of flavorful fat, resting on a natural rack of beef ribs, tender and juicy, possessing a unique flavor of its own, this is truly a special roast. Alas, nowadays, it is truly an expensive roast, one for special occasions. 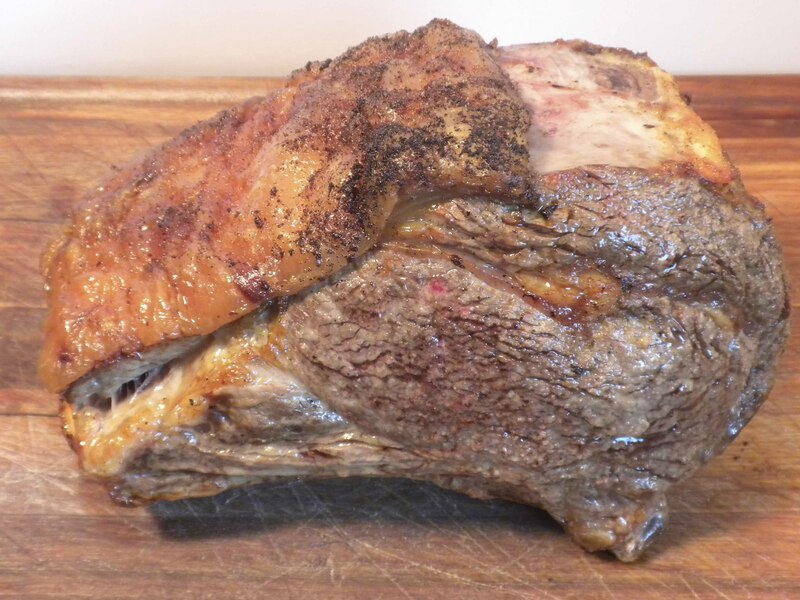 The Sunday roast we usually have is a nice piece of center cut shoulder (also known as cross rib, or shoulder clod). This cut is far less expensive. In fact, center cut shoulder is usually relegated to the crock pot by most grassfed websites and producers. I have learned how to make tender, terrific roasts out of this very economical cut. My cookbook, Tender Grassfed Meat, has no less than eleven delicious recipes for roasting center cut shoulder in the oven. Grassfed center cut shoulder usually has most or all of the fat trimmed off, but I have found ways to compensate for this, which are covered in the recipes. Properly roasted, this cut makes a wonderful roast, often so tender that you can literally cut it with a fork. After we have eaten our fill of the Sunday roast, there is a lot of leftover meat because grassfed meat is so satisfying. I will divide the leftover meat into two unequal portions. The largest portion, in one piece, is destined to become pot roast. The smaller portion, the rarest quarter of the leftover meat, will be turned into a stir-fry or hash. Tender Grassfed Meat has five recipes for pot roast, and I have made all of them successfully with leftover roast. That is one additional meal. We always have leftover pot roast, and that is refrigerated overnight, sliced, and reheated slowly in the flavorful leftover gravy, in the old tradition. That is another additional meal. Finally, we will usually stir-fry the reserved meat with various vegetables, using one of the three stir-fry recipes in Tender Grassfed Meat, which gives us our third additional meal. Following the old tradition of getting several meals from the Sunday roast has really helped us get more delicious meals from one piece of meat. 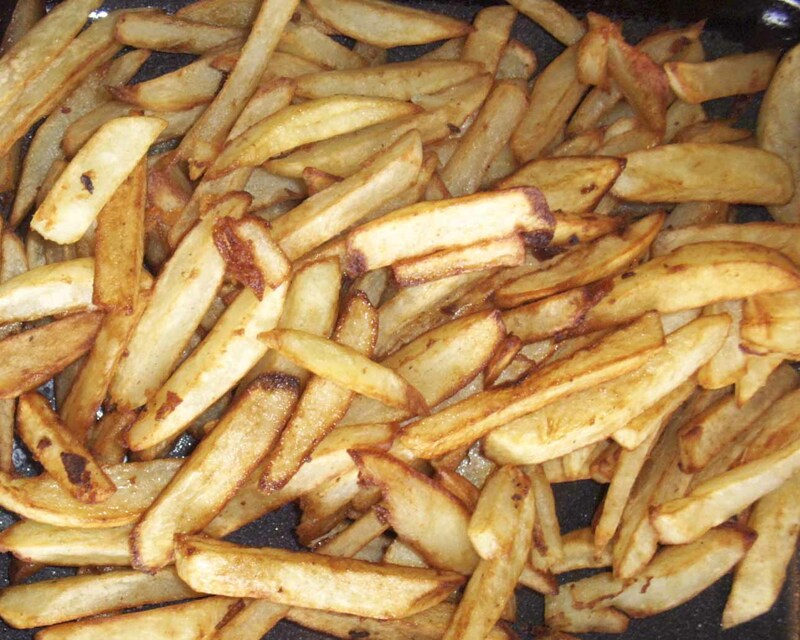 Old Fashioned French Fries, recipe on page 198 of Tender Grassfed Meat. I know literally hundreds of ways to turn grassfed meat into wonderful meals. But I have to confess something. My favorite meal remains what it always has been—steak and French fries. I am not alone in this. Many accomplished chefs have admitted to the same desire. Steak and French fries have gotten a very bad reputation over the last 40 years. I contend that the steak and French fries I will enjoy this coming Father’s Day will be nourishing and good for me, as well as absolutely delicious. Perhaps the greatest attraction of this combination is the joy of eating tender, juicy meat with crisp, delicious potatoes. When I think of steak and French fries, I am not referring to the usual combination of a factory steak with factory potatoes fried at high heat in a modern vegetable oil. I think of a traditional, grassfed steak, with organic potatoes, fried at moderate heat in a traditional fat such as beef tallow or old-fashioned lard. This recreates the original ingredients that gave birth to the tradition. A grassfed steak has much more flavor and will sustain and improve the natural functions of your body. Cooked right, it will be tender and taste so much better. The cuts I prefer for such a festive combination are Porterhouse, or a bone in rib steak, though I will also enjoy a strip steak, or even a less expensive cut such as center cut shoulder or cross rib. A less expensive cut of steak was often used for this dish in France, which was called Steak Frite. The cut I choose for the classic version is tri-tip steak, and my version of Steak Frite is contained on page 77 of my cookbook, Tender Grassfed Meat. 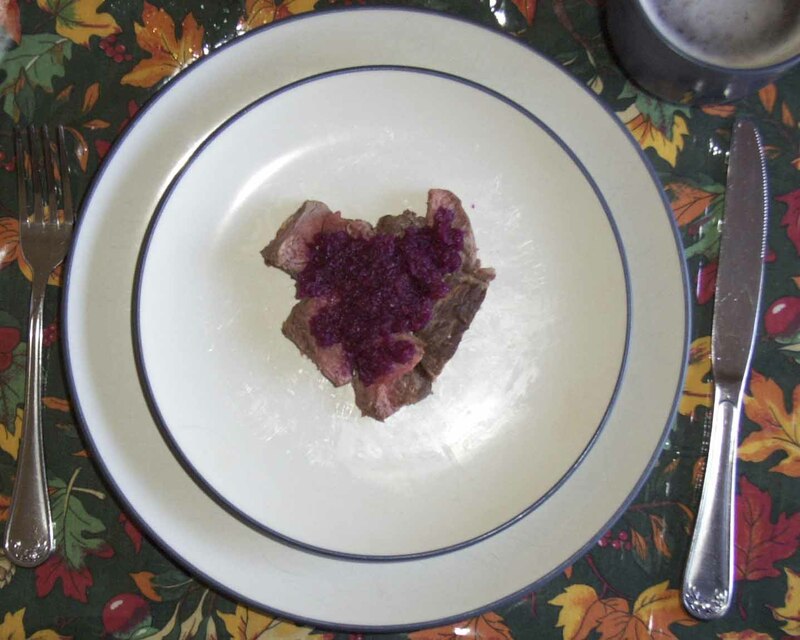 The book also contains more than 20 other recipes for grassfed beef steak. These steaks all have something in common—they all go great with French fries. I use only organic potatoes for French fries. I think it is important to use only organic potatoes, because conventional potatoes have been heavily sprayed with a number of pesticides, and just do not taste as good. I will fry the French fries in rendered beef tallow, or natural, unhydrogenated lard. I will fry the French fries twice, initially at a very moderate heat. Some might ask, “Doesn’t that mean that the fat will get into the potatoes?” You bet the fat will get into the potatoes. That’s a good thing. Eating fat with potatoes is an old European tradition. My recipe for Old Fashioned French Fries is contained on page 198 of Tender Grassfed Meat. You can see how they look in the photo above. They taste even better than they look. A meal of traditional steak and French fries provides important nutrients that will maintain and support the very structure of your body, such as your bones, muscles, and cells, while also supporting your immune system and other body functions. But my main reason for wanting steak and French fries is that it tastes so very good. Great grass = healthy, contented cows. Life begins with the land. The plants we eat cannot provide us with vitamins and minerals unless the soil is rich enough. An animal that has eaten plants grown on depleted soil cannot provide us with the nutrients we need. Modern farming methods can deplete the soil of nutrients. Even traditional methods can deplete the soil unless good crop rotation practices are followed. But one grassfed farmer has reversed this frightening trend. John Wood of US Wellness Meats is renewing the soil on his farm. He has doubled the yield of grass and improved the quality of his forage. This has improved the already excellent quality of the meat he raises. And he has accomplished this with substances derived from long dead plants. The problem of soil depletion is not new. Some of the most barren land on earth was once fertile farmland, until the soil was completely depleted. A number of ancient peoples would leave once the soil was depleted, and move somewhere else, where the cycle would be repeated. In modern times, there have been many reports stating that much of the soil used for farming is depleted, and that plants grown on depleted soil lack the minerals needed for health. These reports have been published by organizations ranging from the United States Senate to the World Health Organization. I have been a customer of US Wellness for many years, long before I wrote a cookbook. In fact, the very first grassfed meat I cooked successfully came from US Wellness. Over the years, I have had many email and telephone conversations with John Wood, the founder of US Wellness. One conversation covered the efforts John was making to improve the soil on his farm. Recently, I noticed that some of the meat I was getting from US Wellness had really improved in quality. The meat had always been excellent before, but it was even better now. The meat was even more tender than before. The meat had a lot of tiny flecks of healthy fat, the very best kind of marbling. The meat always had great flavor, but now it had a wonderful flavor that was better than ever. The meat had always made me feel good after I ate it, but this new meat was even more satisfying and renewing. I knew that something had changed for the better. My guess was that this might have something to do with John’s efforts to improve the soil on his farm. I was right. What John did was to add Humic and Fulvic acid to his land. Humic and Fulvic acid come completely from very old plant matter that has undergone microbial degradation. The interaction of certain microbes with dead plant matter creates a variety of substances that are rich in minerals and other substances. Humic and Fulvic acid not only enrich the soil with minerals, but also provide the nutrients necessary for a number of biological processes that renew the soil, including causing a huge multiplication of the mycortizal fungi. These fungi greatly enhance the ability of plants to use nutrients, including carbon taken from the atmosphere by the plant and deposited in the soil by means of the roots. This is yet another example of how the ecosystem creates life from death—the dead plants eventually turn into a substance that renews the life in the soil. John’s land is now producing twice the amount of grass it used to. In addition, John is seeing a return of a very special grass to his farm. This grass is called Eastern Gamma. 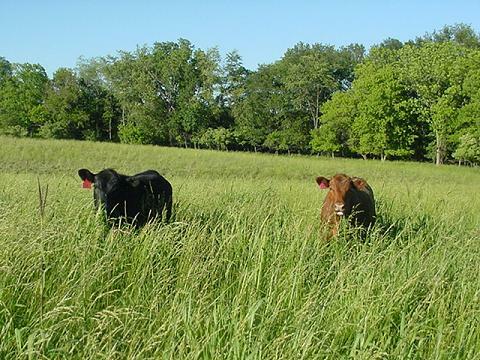 This is a Native American grass that is particularly delicious and nutritious to livestock. It can grow as high as 9 feet, and produces a tremendous volume of forage. Eastern Gamma is considered by many to be one of the most nutritious grasses a cow can eat, and is considered to make the best hay. 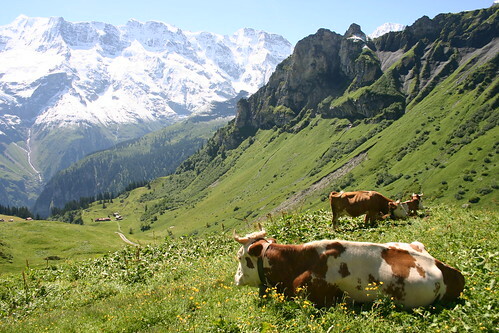 Cattle like this grass so much that it was called the “ice cream grass” in the 19th century. Eastern Gamma has been killed out by close grazing on most ranges, again, because cattle like it so much. You can see the return of Eastern Gamma to John’s farm in the above photo. Those cows are in food heaven! The short answer is two years. John first added the Humic and Fulvic acid to four paddocks in 2006. In 2008, the results were so outstanding that John added the Humic and Fulvic acid to the rest of his farm. The results really showed in 2010, when the output of grass doubled and the quality of the forage substantially improved. It is generally agreed that the minerals in the soil are crucial for the nutritional value of the food. The fact that the land now grows twice the amount of grass certainly shows that there are more nutrients in the soil. The fact that Eastern Gamma is making a successful comeback also supports the increased quality of the soil. But the fact that ultimately convinced me was the definitely improved quality of meat that had been excellent in the past, but is even better now. The meat used to be tender. The meat used to taste great. The meat used to make me feel good and renewed when I ate it. The meat now is more tender. The taste is even better. I feel even more energized and renewed when I eat this fine grassfed meat from US Wellness Meats. The most important factor needed to feed the world is good soil. Without good soil, there is no good place to raise crops or graze animals. Some farming practices deplete the soil and reduce the amount of food that the world can raise. Farming practices that improve the soil increase the amount of food the world can raise. Farmers who renew the land do us all a great service. 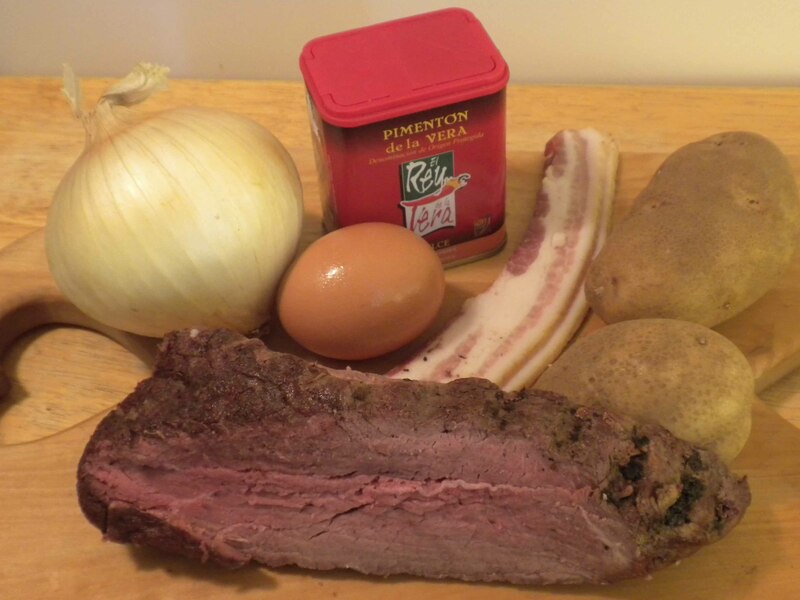 Ingredients: grassfed meat, bacon, potatoes, eggs, onions, and paprika. What to do with leftovers is often an issue. The very word “leftovers” is unattractive. However, leftovers can be the foundation of some absolutely wonderful and frugal dishes. Meat was so valuable and scarce in traditional Europe that it could never be wasted. The Europeans developed many traditional dishes based on leftover meat, usually adding many ingredients to stretch the meat. This recipe is based on this European tradition, and is very tasty and nourishing. The word “hash” comes from the word “hache,” which means “to chop” in French. There are many variations, from Sweden, Denmark, Germany, England, and other countries. All of the recipes include meat, potatoes, onions, eggs, and plenty of fat. I have tried many of these versions with grassfed meat leftovers, and they were all good. But my very favorite is this one, which I based on the traditional Hungarian flavor combination of bacon, onions, and paprika. I continue the European tradition of cooking potatoes with plenty of fat. This dish is so good that there is nothing “leftover” about it. In fact, when my family eats this dish, nothing is left over. 4 medium organic potatoes, peeled and cut into 1 inch cubes. Place the slices of bacon next to each other in a cold 12 inch frying pan, preferably cast iron. Put the pan on the stove, turn the heat to medium, and cook the bacon, turning as necessary, until most of the fat has been rendered from the bacon. The bacon should be fairly crisp at this point. Remove the bacon from the pan and reserve, leaving the rendered fat in the pan. Add the sliced onions, and cook over medium heat, stirring occasionally, for 4 minutes. Add the paprika and stir it into the onions. Continue cooking for another 4 minutes. Add the potatoes, and cook for another 5 minutes, stirring and turning the potato cubes. Turn the heat to low, cover the pan, and cook for another 5 minutes. Add the meat, and stir until the meat is browned, 3 to 4 minutes. Crumble the reserved bacon and stir into the dish. Carefully break the eggs over the hash, and cook just until the yolks set. Serve and enjoy this very nutritious meal. This post is part of Pennywise Platter at the Nourishing Gourmet. My wife made this appetizer in the shape of a heart for me. There is an ingredient that makes all food taste better. It is not MSG. This ingredient also makes your food healthier. It is not a vitamin or mineral. This ingredient also makes it easier to cook the food, and makes the cooking more enjoyable. It is not a cooking gadget. Where can you buy this ingredient? You can’t. But you can create it. And it is free. This secret ingredient is to maintain a cheerful, happy, loving, thankful attitude while you cook. I know this kind of attitude is totally opposite from the competitive frenzy shown on so many cooking shows. These shows imply that good food is created through stress, conflict, complex cooking techniques, time pressure, and competition. I consider this modern attitude to be the psychic equivalent of factory food. But I know the ancient secret. I came across this ancient secret while I was researching my cookbook, Tender Grassfed Meat. I read a number of old cookbooks, from every corner of Europe, America, and other parts of the world. Time and time again I came across this advice, in dozens of old cookbooks, from many different countries, expressed in many ways—never, ever cook when you are angry or upset. Be cheerful, happy, and grateful while you cook. I also remembered the story of Marya Palma. Marya Palma was the family cook for my grandparents. My grandfather, an eater of mythic proportions, ate a meal at her tiny restaurant in Poland. The meal was so good that he paid her a small fortune to travel to his home in Manchuria and cook for him. Marya Palma was a huge, combative, formidable woman who had known great tragedy in her life, and was afraid of nothing and nobody. But when Marya Palma cooked, she was happy and cheerful. Marya Palma was such a magnificent cook that it was common for the guests to carry all 300 pounds of her around the dining room after a dinner, the ultimate tribute they could give to a cook. Since I kept reading this advice, over and over again, I decided to take it. That was a very good decision indeed. First, I plan the cooking so as to minimize any chance of being angry or upset. I select a recipe I have time for. I prepare and organize all the ingredients so they are pre-measured and ready to be added when the time comes. I do not start cooking until everything is in its place. I learned to create this cheerful attitude by focusing on the food and thinking about its benefits. I look at the good ingredients, think of where they came from, of how much work and effort and wisdom it took to raise this good food, which will nourish and sustain the lives of me and my family. I think of how the real, healthy food I cook will nourish my family and friends. I think of how this good food will make them stronger and healthier. I think of how much they will enjoy the tasty food. And, to be honest, I think of how much I will enjoy the food. After a few minutes of this, I am quite cheerful and happy. I maintain this attitude by paying attention to the food as it cooks. I watch the changing colors of the browning meat, the deep green color of perfectly cooked vegetables. I listen to the sounds the food makes as it cooks. I smell the enticing smells of cooking meat, as my mouth waters. Good food appeals to all our senses. All we have to do is pay attention. I became a much better cook when I added this free ingredient. I know this may sound mystical, and there is no way to prove this through science, but I truly believe that the happy, cheerful feelings I cook with somehow improve the food, making it healthier, more digestible, and certainly tastier. Traditional wisdom supports my belief. If you add this free ingredient to your food, I predict that your food will taste better. Everything you cook will taste better, and you will enjoy cooking so much more.